Central American music is greatly influenced by a lot of different cultures from the rest of Latin America, North America, the Caribbean, Europe and even Africa. Out of all of those cultures, the African and European influences are the most noticeable. European music entered into Latin America through the invasion of the Spaniards over 500 years ago. When you visit the region you will be able to notice that Central American traditional music and musical instruments differ amongst the countries and sometimes even towns within a country. That is because most use as a base the local indigenous traditions and add to it the influences that were brought by the conquerors. Slavery also made a great contribution to the evolution of Central American Traditional music. Slaves brought from different parts of the world also came with their own traditional music, dances, and instruments. Most of the instruments derived from Spanish and African sources. These mainly consist of different types of drums, being one of them the timpani of Europe. These drums suffered a transformation over the years and turned into the congas, bongos, and timbales that we know today. An instrument brought from Africa that became popular among the Central American musicians of the time was the Bata. These instruments were made from gourds. Another interesting musical instrument is a cylinder cabasa with balls of steel and is made in such a way that it could be rotated with an attached handle. Then there is the shekere which is made of gourd and covered with a beaded net. In order to make sounds with these you have to use sticks and keys. Belize has many forms of music but one of the most popular was developed by Caribs-descendants. This type of music heavily depends on drums for the instrumentation. The banjo, accordion, guitar, and percussion are also commonly used to produce the unique sounds of the Belizean traditional music. 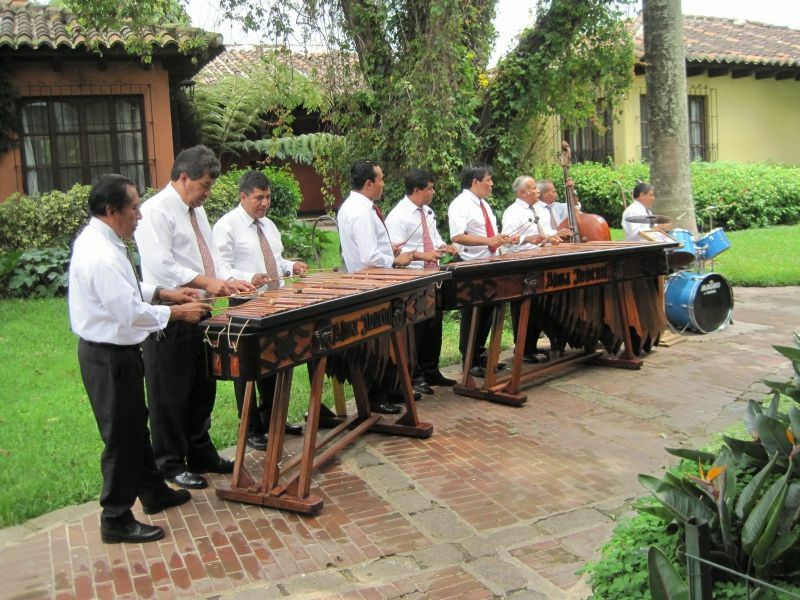 A little to the south, in Guatemala, the most traditional instrument is called marimba. It is so loved by locals even to this day that they decided to name it their national instrument. It is a percussion instrument made out of wood that resembles the keys from a piano. To make it sound they use sticks with rubber balls on the tip. El Salvador has two main types of traditional music, one is cumbia and the other one is El Salvador’s folkloric music. From this country, a dance called Xuc stands out. It was decreed by the local government in 1950 as the national dance of El Salvador. Next is Honduras. Here, especially on the Caribbean coast, you will be able to hear the Garifuna music. This is very similar to the music you will find on the coasts of Belize because they both come from Garifuna populations. In fact, Garifunas in Honduras got there after migrating from Belize. Nicaraguan music is mostly marimba, but there is a twist. It also includes some drums and from the Garifuna culture. Palo de Mayo is quite common here. It is a traditional dance with Afro-Caribbean roots. The music used as background for this can be described as intense Creole acoustic folk rhythms. The musical style is also known as Palo de Mayo. There are two Panamanian traditional instruments. One is a string instrument that is called mejoranera. It has been used for a lot of time by natives from Panama. Then there is a three-stringed violin called Rabel. It has Arabic origins and was brought to the area by Spaniards.